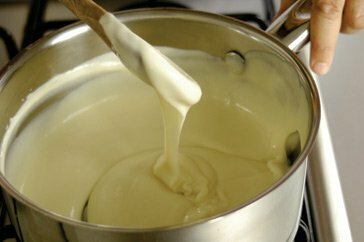 Heat the milk in a saucepan until hot. If you are using the optional flavourings, add them to the milk then bring to the boil. Remove from the heat, cover and leave to infuse for 10 minutes. Strain the milk to remove the flavourings. Make the roux by melting the butter in a heavy saucepan. When it begins to foam, whisk in the flour and cook, stirring all the time until foaming - about a minute. Remove the pan from the heat and add half the hot milk, whisking constantly. Return the pan to the heat and whisk until the sauce begins to thicken. Add the rest of the milk off the heat and whisk. Return the sauce to the heat and bring to the boil, whisking constantly until the sauce thickens. Season to taste with nutmeg, salt and pepper and simmer for a further 2 - 3 minutes.